The Mekong River is one of the few remaining free-flowing rivers in Asia. On its 4200 km long way through six countries – from China at its source, to Vietnam where it enters the sea – sixty million people depend on the river for their livelihoods. 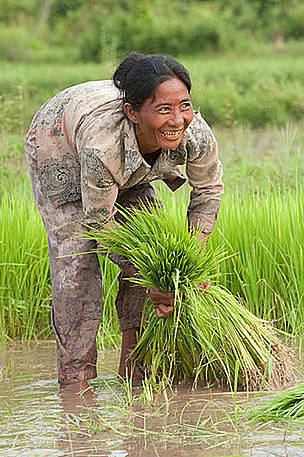 Its colossal high flows create large wetlands during the rainy season that enable irrigation for vital rice production and other agriculture, as well as a high levels of fish production. These wetlands also contribute to the high biodiversity found on the Mekong in terms of fish, birds, mollusks, crustaceans, and reptiles. 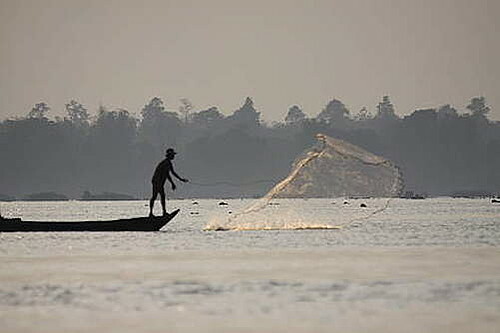 In fact, in terms of fish biodiversity the Mekong is second only to the mighty Amazon. In addition, many of globally significant terrestrial fauna species of this hotspot, including the Hog Deer rediscovered by WWF-Cambodia in 2006, rely on riverine habitates such as river banks, island vegetation and midstream sandbars, which are also under increasing threat from human-induced changes. In the recent years, the river and its tributaries have become a global hotspot for hydropower development with pridicted disasterious environmental impacts, including declining water quality and fish stocks, incision of riverbeds, bank erosion and global collapsing of freshwater biodiversity, including potential extinction of endangered and irreplaceable Mekong River species. Threatened species in the Mekong River Ecoregion include mammals such as the iconic Irrawaddy dolphin and gigantic fish like Mekong giant catfish, giant carp, and giant freshwater stingray, all of which can exceed 200 kg in weight. Many of the globally significant terrestrial fauna species of the ecoregion rely on riverine habitats such as river banks, island vegetation and midstream sandbars. Unfortunately, these vulnerable wetland resources are under increasing threat from human-induced changes to the Mekong River and its tributaries. fish for food, water for transport, irrigation for rice fields, natural flood control, and finally a home to such iconic and endangered wildlife as the Irrawaddy Dolphin. Across its entire length, the fisheries of the Mekong alone are worth over US$ 1,500 million per year; that is, more than US$ 4 million per day or US$ 50 per second. But the Mekong River’s incredible wetland resources are threatened by human development and overuse. Find out more about the first detailed survey of the Mekong in northern Cambodia.